Predictable results can be fleeting for many dentists. When critical steps are either not followed through on or not followed by manufacturers directions, clinical success is not achieved. Each step is predicated on the success from the last. The goal of this course is to create consistent results in a variety of situations. A step by step approach will be reviewed for a Class V composite, placement of an all ceramic unit, a Class II composite, placement of a ceramic onlay, and taking a single implant impression. Predictable dentistry is always the goal and while adhesive dentistry is taught in dental school many well intentioned dentists quickly lose track of the ever changing science behind this extremely important and complex topic. 1. Describe the steps when placing a Class V composite. 2. Describe the steps when placing an all ceramic unit. 3. Describe the steps when placing a Class II composite. 4. Describe the steps when placing a ceramic onlay. 5. 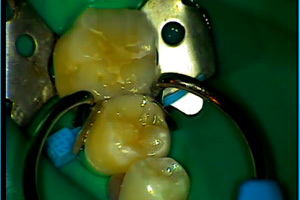 Describe the steps when taking a single implant impression. T. Croll, Y. Bar-Zion, A Segura and K Donly. Clinical performance of resin-modified glass ionomer cement restorations in primary teeth. J Am Dent Assoc, Vol 132, No 8, 110-1116. C. Ramsey. Placing all-ceramic crowns using Mulilink universal adhesive cement. Dental Products Report. August 2004.